Open home security - your Arduino burglar alarm: New main unit. 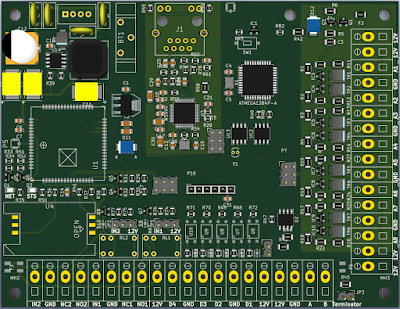 As new node PCB is in transit, I have some time to move forward in design of new PCB for main board. It will be bigger with all necessary components on it. 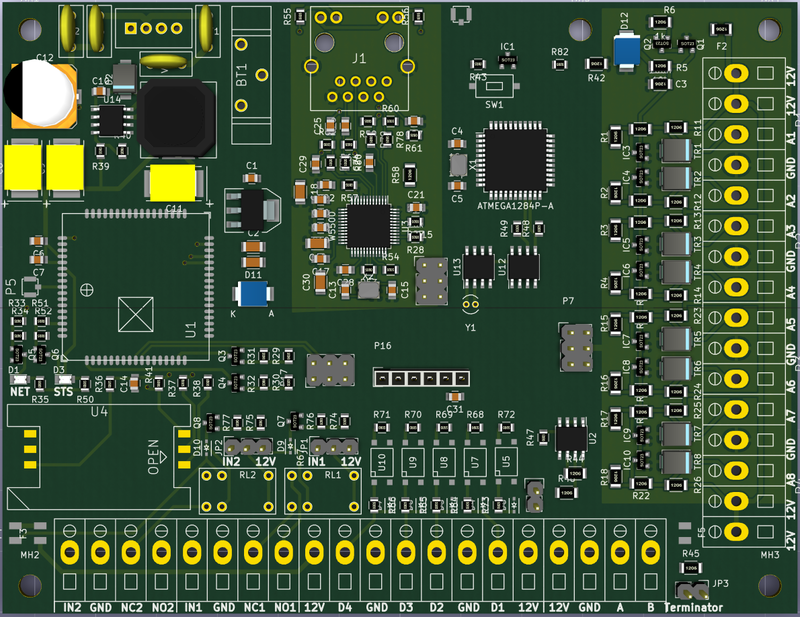 As I have moved from Eagle to KiCad, I will wait for the new node PCB to see what mistakes it will bring. Lately I was in search of new fabrication house, but boards bigger then 10x10cm are rather expensive. My new board will be most probably 10x13cm and it is about 50USD without shipping for 5 pcs at least. It becoming a bit expensive fun, hope to not make serious mistake. But new board is getting into final shape. It has WizNet W5500 Ethernet chip, SIM900 for GSM, and also some other improvements like better analogue protection, and RFM69HW. It will be drop in replacement for any old wired burglar alarm. It will also have new nice big and 45° angled screw terminals. I have also in mind extension board the will plug on top of the analogue part that is on right side and allow 8 ports to be added. They will be stackable up to maximum of 4 boards, together 40 wired analogue inputs connected directly to main board. Also I'm thinking now, it as it looks like final product, I will sell the finished boards and nodes. I guess it can be a good jump start to any one who wish to do some security alarm at home and use as sensor gateway for home automation as well. And still use the Arduino code and various libraries to tweak it, add new functionality or features. Believe me the old 8bit atmega has still power to do all these things fast and reliable. Very interesting. Thanks for sharing. I'll follow the development of your project.